To promote my debut release, I’m giving away one Kate Spade handbag, purchased at the actual store (no outlet!). To enter you have a few choices. You can comment on this post about your favorite brand of handbag and why, leave me a book review on Amazon or send me your proof of purchase of my new book, Out of Practice Aphrodite, to chandlermaid@gmail.com. That’s it! Please remember, there is no purchase required to enter. It’s optional, but it will give you more chances to win because it’s worth 10 entries. The book is only available in e-book format right now, so you need a Kindle, Nook, iPad, Kobo or the apps downloaded to purchase it. If you decided to purchase the book, you can either send me a screen shot of your Digital Orders via your Amazon page or forward me the purchase email from your chosen outlet. The actual receipt has to be sent, and I will be checking transaction numbers to make sure everything is on the up and up. During my Kindle giveaway I disqualified over 25% of my entries because of dirty pool. So…I won’t lecture, just don’t do that. I add people to my banned list and report them to pretty much anyone who will listen. If you decide to leave a review (worth 5 entries), please make sure you leave the link in the appropriate area using the Rafflecopter widget or email it to me at the above address. Purchases made before the second day of June are not eligible to enter. Sorry! Also, this contest is for U.S. entrants, age 18+ only. The rules for other countries are a wee bit sticky. The contest will end on July 15th, and one lucky winner will be randomly selected later on during that week. Up for grabs is the Cobble Hill Little Curtis Handbag worth $278.00 in Grace Blue. You can find the description of this bag here. *All of the below is legally required information concerning release of liability. The winners will be announced on or about July 20, 2014 on or about noon CST. Announcement and instructions for prize will be sent to the e-mail address supplied on the potential prize winner’s entry form. Each entrant is responsible for monitoring his/her e-mail account for prize notification and receipt or other communications related to this sweepstakes. If a potential prize winner cannot be reached by Administrator (or Sponsor) within fifteen (15) days, using the contact information provided at the time of entry, or if the prize is returned as undeliverable, that potential prize winner shall forfeit the prize. I love my first Kate Spade shoulder bag because it was a birthday present that I received while pregnant with our son. Thanks for the chance to win. I don't have any Kate Spade bags as yet, but it really is my favorite brand. Just recently, my sister in law had gotten a beautiful bag and I adore the style of it. The quality is really top notch and honestly, it's one of the better bags that I've seen. I love Kate Spade… I think they are sassy bags that are perfect for girls like Aphrodite, and myself! Perfect for a night of mischief! My favorite kate spade bag is the Kate Spade Cobble Hill Small Leslie Convertible Satchel. My favorite handbag at the moment is my navy blue longchomp. It's so casual and preppy and it goes with everything! I love Kate Spade handbags because they're sleek, professional, and trendy! I love an over the shoulder bag with adjustable and detachable shoulder strap and a flap closure with magnetic snap. I like my Relic bag because it is spacious and goes with my outfits. I think this COBBLE HILL LITTLE CURTIS is my favorite—in black. It looks like a great, easy style. i love my nine west brown bag, its large and its brown color goes with everything! Last year I got a green and white striped bag from Kate Spade. It's huge and holds everything. I loooove that teal colored bag. That is my favorite color and I love the style. Hermes is my favorite brand of handbag: beautifully crafted, exquisite materials, classic. Can't wait to read your new book! Read that you are from TX – same here – hook 'em horns! My favorite Kate Spade bag is the Catherine Street Pippa. It's such a beautiful purse. My favorite handbag is a black Italian leather tote bag. My daughters and husband gave it to me for Christmas last year. Love Kate Spade!! 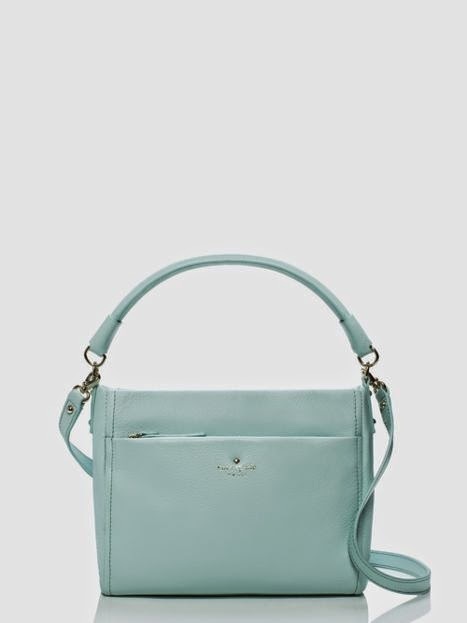 My favorite bag right now is a Coach satchel that's a deep teal. Everywhere I take it someone seems to take notice! I usually buy Coach bags but all my eye wear is Kate Spade. I love the Veranda Place Nylon Stevie Baby bag. I could see myself with it! If I won, this one hands down. No Kate Spade bags as of this writing. My current favorite bag is purple and I love it because of the color and because it's huge! It's a bag by Iman and I've had it for at least 6 years. Samantha R., you are the winner of the Kate Spade. Please email me with your address! I'll also announce on Twitter. Thanks!